Governments of the world are facing national and global demands for greater levels of transparency that allow citizens and other nations to hold them accountable. These pressures and responses are fueled by innovations in information and communication technologies (ICTs) and expanding technological capabilities and efficiencies. Advances in ICTs have enabled governments to make digital data available to the public through the Internet. Making such data available to the public is an important first step in achieving government accountability through improved transparency. An example of global government accountability efforts is in spending transparency. Demands for spending transparency often take the form of national-level legislation, international agreements, or Web-enabled access to information. Examples of each include the spending reporting requirements mandated in the 2009 American Recovery and Reinvestment Act (Recovery Act), the US and Brazil led Open Government Partnership initiative and USAspending.gov. The Open Government Partnership is a new multilateral initiative that aims to secure commitments from governments to promote transparency, empower citizens, fight corruption, and harness new technologies to strengthen governance. In the spirit of multi-stakeholder collaboration, OGP is overseen by a steering committee of eight governments and nine civil society organizations. Making government spending data available to the public through new collection, integration, and sharing strategies requires new organizational and technological capabilities. Governments need innovative information management and cross-boundary governance strategies. Information management innovations include effective use of information technologies and a culture of information stewardship that embraces the public value of government data. Cross-boundary governance innovations include new policies and processes that enable disparate agencies that own or maintain spending data to make decisions across traditional organizational boundaries. Combined, these capabilities allow organizations to create, collect, integrate, and share public information in ways that support organizational purposes and transparency goals. New York State overcame challenges it faced in implementing the Recovery Act's spending reporting requirements. These experiences provide valuable insights into the types of information management and governance practices that worked. These practices can help governments, at all levels, deliver multi-level, multi-jurisdictional spending transparency reporting and sufficient, timely, and accurate data for citizens to hold government accountable. The Federal Funding Accountability and Transparency Act (FFATA) was passed in 2006 and established the USAspending.gov. This single searchable website for all federal spending summarizes major categories of federal spending, provides an IT dashboard for major technology projects, identifies top government contractors and assistance recipients, and links to procurement information and related resources. Requiring multi-tier reporting was an important departure from the 2006 FFATA model of relying solely on state agency reporting. This departure has spurred the introduction of a 2011 bill to replace FFATA, the Digital Accountability and Transparency Act (DATA Act). The OMB Watch, a non-profit research and advocacy organization that tracks developments in federal spending transparency, compared the current FFATA legislation with the DATA Act. OMB Watch argued that while the DATA Act looks to further institutionalize multi-tier federal spending transparency and create common data elements and another website to display spending data, the DATA Act differs in that it includes a sunset provision, vague definitions of who recipients are, and is missing important data elements and processes for data checks. The Recovery Act reporting was a first-of-its-kind effort to collect real-time spending data on all tiers of awards and sub-awards issued by the US federal government. Recipients were required to report, not just expenditure data, but accountability and outcome measures such as job creation. CTG UAlbany conducted a series of forums with NYS agencies to identify and document important implementation insights and lessons learned from Recovery Act reporting experiences. With little or no federal assistance for new infrastructure or processes to meet this requirement, New York, like most states, had to rely on a mix of existing and newly developed resources, relationships, and processes to track and report expenditures and results. 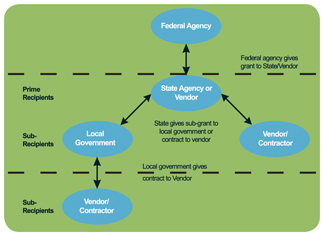 These efforts affected IT systems, business processes, and relationships across government and private recipients. For states with many Recovery Act awards, reporting requirements generated transformative information management and governance practices. Those have become institutionalized beyond the Recovery Act period. However, states with few awards used unsustainable workarounds to respond to what the treated as a one-time federal mandate. Examining what happened during the Recovery Act reporting periods is necessary to ensure that efforts going forward will build on capabilities created in the process of creating a new level of spending transparency. a mandate to make information more accessible and transparent. While agencies with a small number of grants could focus on minor process changes and use spreadsheets to meet the novel aspects, for those receiving hundreds of grants with hundreds of sub-recipients it was clear that new investments in IT and other capabilities had to be made. NYS DOT brought together business units to make decisions around data and to establish new data governance capability to better understand the collected information. NYS DOT turned to their IT department to build the necessary Web interfaces to gather the data into a data warehouse, this allowed for reliable data from existing systems (right). 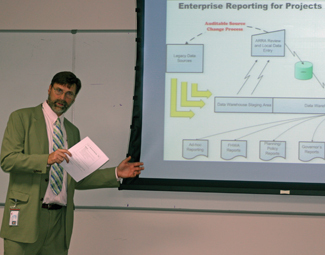 gained a new appreciation for the value of integrated information and reporting from a business analytics perspective. The insight of attendees provided a window into the complex relationships of IT and organizational innovation under pressure. The New York State Department of Transportation (NYSDOT) was a recipient of approximately $1.57 billion in Recovery Act funding for several programs, including Highway Infrastructure Investment, High-speed Intercity Rail, Non-urban Transit, Ferry Boat, Youth Construction Initiative, and Clean Diesel. This meant that NYS DOT was required to report Recovery Act spending information on a monthly basis to FederalReporting.gov and to its federal counterparts. NYSDOT began using spreadsheet templates provided by FederalReporting.gov to track more than 440 projects being advanced for the Highway Infrastructure Investment Funds in early 2009. NYSDOT soon realized that the requirement to provide one spreadsheet per award was not feasible. By May 2009, the department made a strategic move in collaboration with its federal counterparts to transition from spreadsheets to a data warehouse that utilized XML for reporting purposes and business intelligence tools. With the time pressure first reporting period and the possible risk of losing award funds, a redesign of business processes was difficult or impossible. NYSDOT focused its efforts on identifying and aggregating data from existing operational systems and bringing that into its data warehouse to meet its reporting needs. NYSDOT staff mapped all critical reporting data with business processes, pulling from eight operational systems in different functional areas within the department. The communication channels between the IT staff and the program areas responsible for transportation projects were streamlined. While standard project management methodologies were followed, team members from multiple program areas engaged in informal communications as needed to collaborate. Finance, internal audit, construction, planning, and IT program areas learned more about each others’ business processes and were able to redesign how information flowed throughout the department. The Director and the Recovery Act team, drawn from the program areas and Federal Highway Administration staff, met biweekly to discuss key issues, program status and to share information. A lead reporting manager and website manager were assigned to oversee dissemination of information to the public and to ensure an appropriate level of transparency required by the Recovery Act. Key performance indicators and metrics were established to help NYSDOT manage the program and to ensure successful results. NYSDOT’s Recovery Act Program won the 2010 GTC East Best of New York Award for Project Excellence. The benefits of collaboration, data governance, performance metrics and information management gained from the Recovery Act was extensive. This knowledge is being applied to advance NYS DOT's ‘3R’ key performance indicators and toward developing an enterprise data warehouse that will streamline data management capabilities further, providing even greater savings and value. The NYSDOT Recovery Act website is www.nysdot.gov/recovery. Beyond its role as a trigger for renewed attention to data and transparency, the reporting requirements of the Recovery Act highlighted the importance of information management with a culture of information stewardship. Information stewardship is the practice of treating government data as a resource or asset that has organizational, jurisdictional, or societal value to a wide range of different ‘consumers.’ Therefore, it is important to treat data as an asset when collecting, sharing, and storing it. The new emphasis on transparency resulted in new users, and uses of, the information. Some agencies created spending barometers and geo-coded contracts, and displayed them using maps along with additional contextual information about spending through related data links. Many new uses of data depended on having the appropriate information about the context of data collection. Both program and IT professionals spoke of the importance of understanding data use from the user’s perspective. Agencies began rethinking how existing and new information technologies could accommodate the requirement for real-time data consumption and spending transparency. Right - At CTG UAlbany's first forum, Tom Johnston, Manager of the Business Solutions Bureau and IT Lead on NYSDOT’s Recovery Act project team, shared information technology solutions developed by NYSDOT to manage Recovery Act reporting for the first reporting deadline, October 10, 2009. Beyond information management considerations, agencies shared how each found new ways to coordinate internal work and new relationships with external organizations and agencies. Many created ad-hoc governance structures that allowed cross-organizational teams to share information needs and work practices among divisions that otherwise did not coordinate. Some agencies used virtual collaborative software to organize internal efforts and facilitate communication across functional teams. These techniques smoothed interactions among reporting units, but had different work practices, desired levels of information quality, and uses for information, such as internal controls, auditing, and risk management process. Agencies noticed many data quality issues, such as the volume of data being collected and the rapid turnarounds required for reporting. Governance became a critical issue. Collaborating organizations realized data quality was no longer just an IT issue department, but a business issue that cut across all facets of spending reporting. The need for consistent, timely data required new real-time processes for review and approval. Pressure to avoid public exposure of mistakes in data added to this need. The federal government created some of the necessary structure by instituting reporting schedules. These schedules enabled data correction after reporting deadlines passed. However, agencies devised new data entry processes for sub-recipients to avoid data entry issues that were inherent in past reporting methods. Others created new processes that allowed sub-recipients to enter data directly into a Web-enabled form. Data standards are necessary, but data governance is just as important. Promote practices and a culture shift focused on information stewardship. New policies, procedures, and work processes across levels of government will need to be worked out. Technology’s role is multi-dimensional, it serves to collect, disseminate, visualize, and coordinate implementation activities. The requirements outlined in the U.S. Recovery Act for tracking spending and delivering spending information to the public are the start of new requirements and expectations for government spending transparency and accountability. The lessons learned through the Recovery Act reporting experience provide a boost for governments around the world as they begin to lay out new strategies for achieving spending transparency. The challenge ahead is for federal, state and local agencies and private contractors to learn from the experiences of Recovery Act reporting and to use that knowledge to guide the creation of necessary capabilities to meet citizen expectations regarding spending transparency.